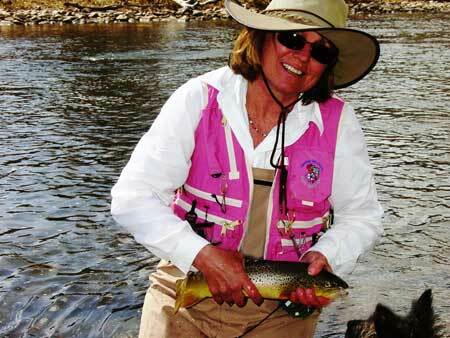 Women's Fly Fishing - About Char Bloom - fly fishing guides, fly fishing apparel, fly fishing news, fly fishing information, women in fly fishing and more! I remember well the day I went into a sporting goods store to get “outfitted”. I stood at the mirror in frog green neoprene waders, a khaki vest and two-tone beige/brown wading boots. I looked at the price tag in disbelief. I was about to spend a lot of money on some very unattractive items. I was excited about learning to fly fish but not about the clothes I'd have to wear. I traveled to Lew Beach, New York where I successfully completed The Instructors Fly Casting Course taught by Joan Wulff. It was an honor to spend four days with Joan who is a warm, wonderful and extremely skilled competitive fly caster. where I learned to row a drift boat. I was most inspired by the skills and personalities of the women who spent their lives on the rivers. Last year, after rowing hundreds of miles, I became of member of Hyde Boats Pro Staff, one of only four women in the world. There’s not much I enjoy more than rowing my pink drift boat. I find it exciting to be designing and marketing women’s fly fishing clothing and art. I'm touched by the many emails I receive from smiling women in their bright new clothes catching equally colorful fish. My children are grown and on their own individual paths in life. Along with my two Cairn Terriers, Doodlebug and Ranger, I'm living a joyous life on the rivers of the West. In the last few years, I have made many lifelong friends through my clothing business, teaching, rowing and fly fishing. It has given me a unique opportunity to share my passion with others.